How about an inductive load? The documentation is non-existent. I accidentally discovered a self-test/calibration mode by connecting all 3 leads to each other and pushing the button. On-screen directions kind of guide you through each numbered step if you scratch your head long enough deciphering them. A 100nF capacitor is required at one point (step 4, IIRC). Anyway, a cute little gizmo, certainly worth the $20 and it seems reasonably accurate within the scope of it's limitations. 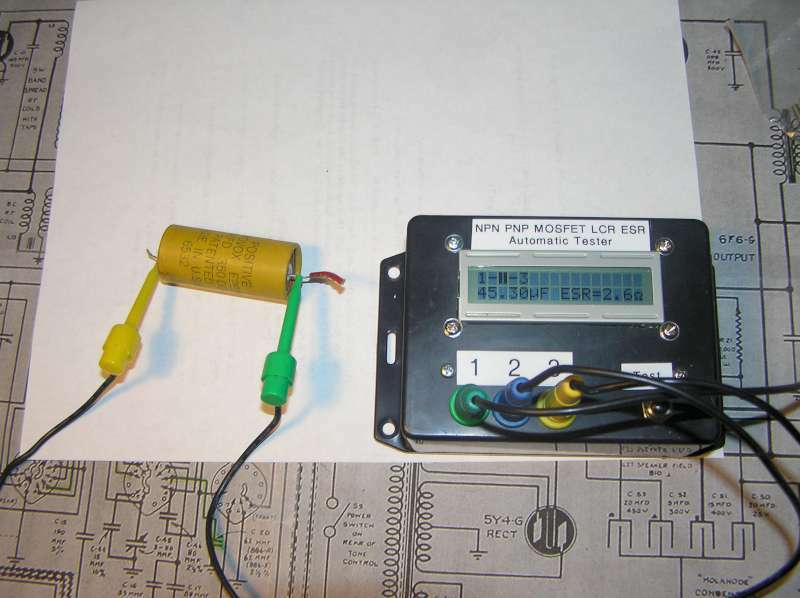 Could you give a few more capacitors a try to see if it actually can measure ESR. What is the test voltage for capacitors? I looked for the review or blog and got nowhere. A link please? I am not sure what the test voltage is for capacitors, I looked at the test sequence on a scope and it sends out a lot of little pulses on the leads, and which does what is beyond my ken. However, the highest voltage seems to be about 3.5v or thereabouts near the end of the sequence with a capacitor attached. I had a quick look at that blog link. It may have been the genesis of this one, but it's certainly not the same thing. I got one of these too - they are a lot of fun. The component values are usually within 1%. Does a pretty good job correctly identifying transistors, diodes, etc. I did try a tough test - a RCA 2N3669 thyristor and it identifier it as a 33 ohm resistor. 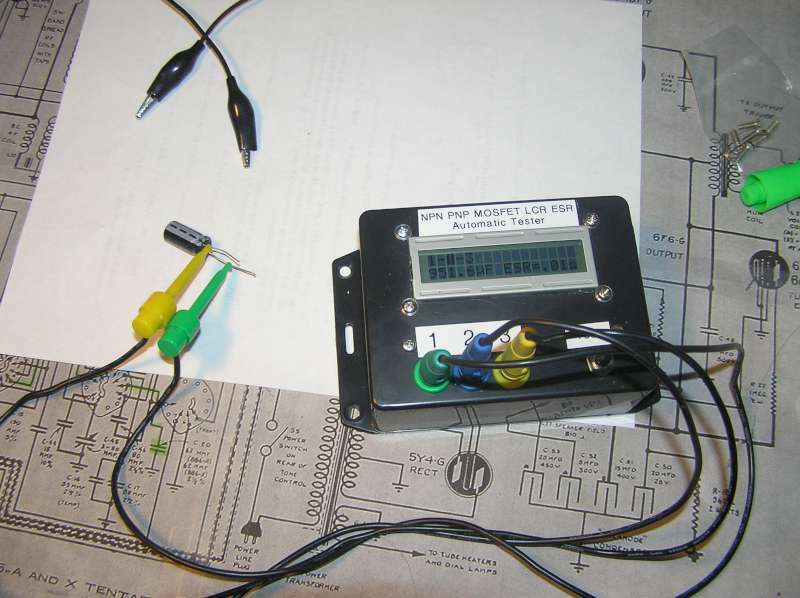 This is not surprising as there is a built in 33 ohm resistor from gate to cathode. It found the resistor and didn't look any further I guess. Not sure how good it is as an ERS meter. I am not going to do any proper tests now. If I short two inputs together, I get 0.2 ohms and there is nothing to cancel this out. 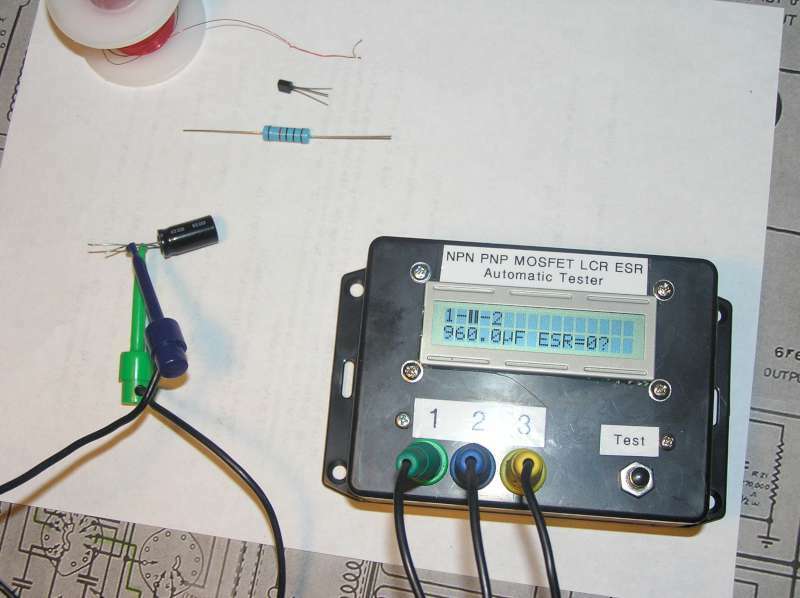 The best accuracy you could expect is 0.1 ohms even though the software calculates ESR to 2 places. If I get to fiddle with the software, a feature to force it to test in one mode (resistance, capacitance, inductance, etc) could be good. As a single button tester, it is not bad at all. If I short two inputs together, I get 0.2 ohms and there is nothing to cancel this out. 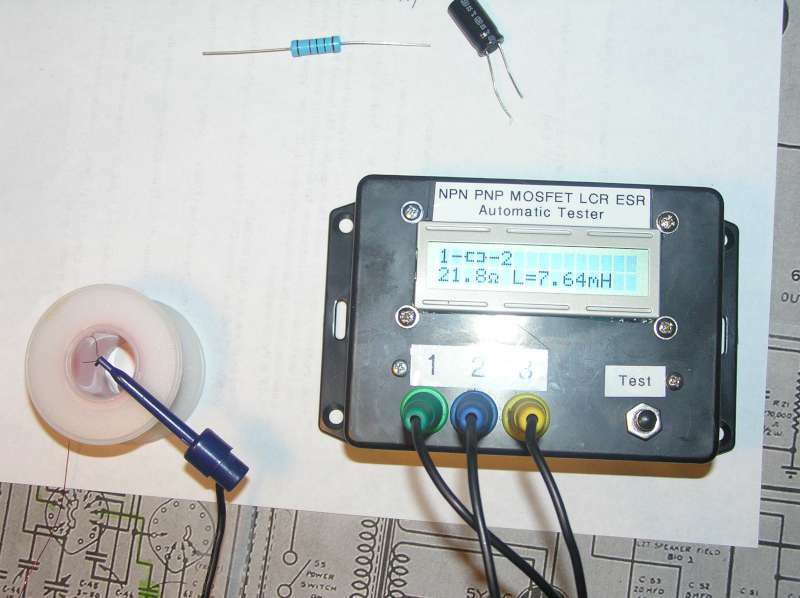 The best accuracy you could expect is 0.1 ohms even though the software calculates ESR to 2 places. If you short all 3 it will go into the self-calibration mode and then it will read 0 ohms when you short 2 leads together. Just make sure you have a 100nF capacitor handy and follow the prompts or it will eventually read 33pF when you short 1 and 3. Don't Ask Me How I Know This(tm). I went through that damn routine more than once before I figured it out. Wow - I just did it (including the 0.1uF 0.5% cap) and it does do the self-calibration test. Who needs metrology labs? After calibration, a short went down to 0.1 ohms, but to be fair, the wires I was using to short the pins for the calibration were not the best. Looks like they use a 2V zener in series with 2k2 from a 5V regulator. That will not be very stable. I think the original circuit used a LT reference IC instead. I wonder how it calibrates its voltage reference? Update: After the calibration, I now get 35P between pins 2 and 3 with nothing connected. I better read up on the calibration. That is the original by Markus Frejek. ... see Download for a link to the full source + comprehensive documentation. Here is the most recent PDF for the tester, including information about the chinese clones. I have to say it is a really great manual. You are meant to replace the zener with a decent reference. In the self calibration, the shorted inputs should be removed during test 4. When this is done, the tester works properly again. The V2.2 board I got has a JTAG 10 pin ISP port and a ATMEGA168 (with the part number rubbed off) and apparently it works fine if updated to the latest software. Mine came with software version 105k. Karl Heinz's's latest version is 106k. I will give it a go sometime. There are some additions that can be done. 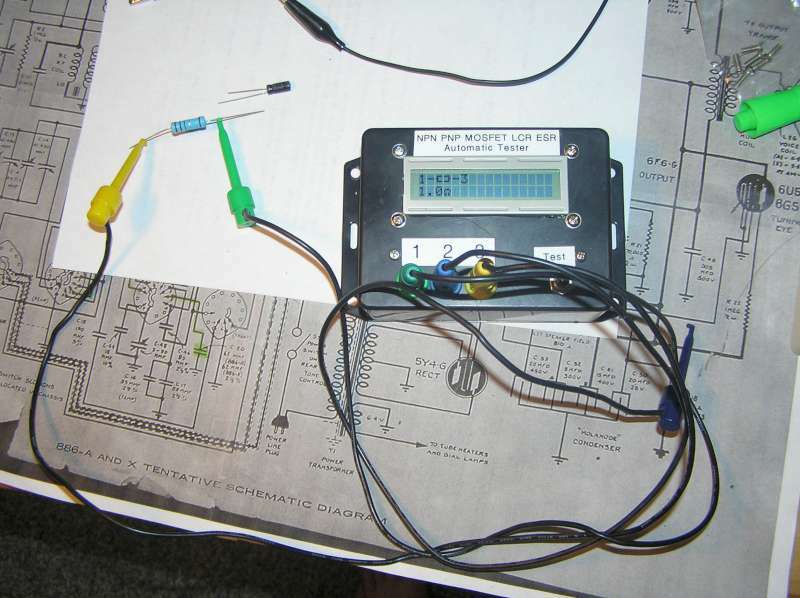 One is a circuit to generate up to 30VDC for measuring zener breakdown voltage. Just tested the accuracy of my home made version. A 0.01% 5k resistor reads 5066, so about 1.3% which is good enough for a quick test. I matched the 680r and 470k resistors to the third digit, maybe better matching would help. The two jumper wires are optional. 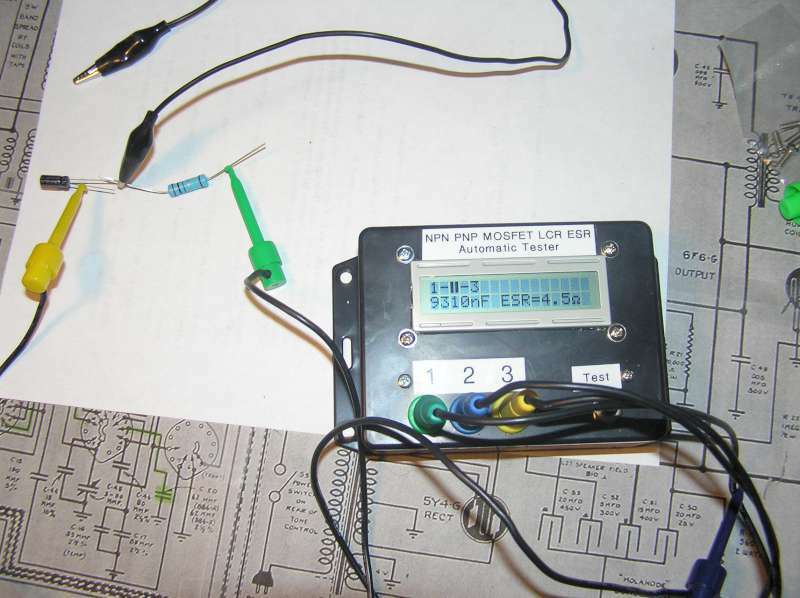 You probably don't need the 5V jumper wire to the program header. Even if you program the 328 in circuit just make sure the board is powered by keeping SW1 closed. You should always try to avoid supplying power to a circuit from both the board and your programming device, this is not be a good thing as you should never let the beams cross . The Reset jumper wire is needed if you program in circuit. If you program the 328 out of circuit you can ignore this jumper and the 6 pin header. 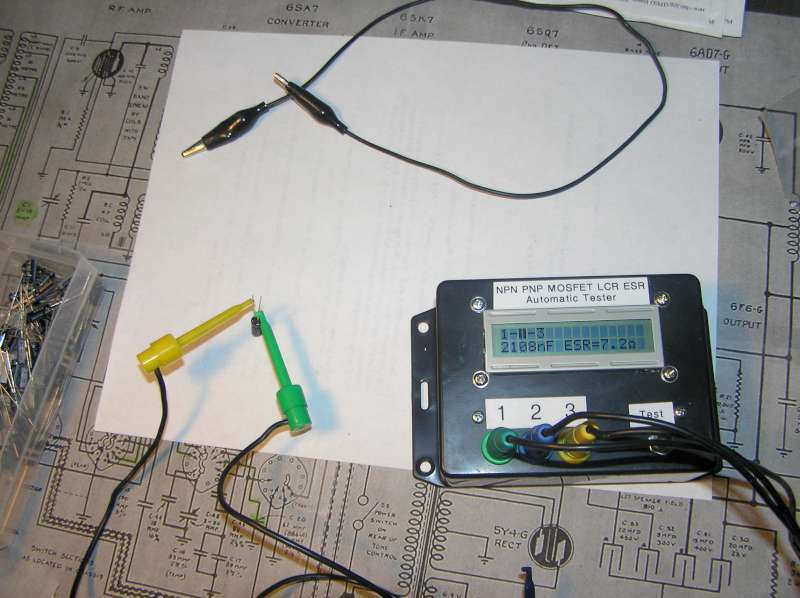 set for measuring of resistors with low resistance." set of ESR measurement must be done after every selftest and in this case you should always repeat the measurement some times." I won't quote the entire section on how the ESR is done. However, the doc confirms that the device will only determine ESR for caps over 2uF. I suspect this is because the frequency is only 680Hz instead of the more traditional 100MHz. Apparently it repeats the test 128 times and sums the values to derive the final answer, but he cautions that the ESR test is not to be considered accurate compared to a dedicated ESR meter. 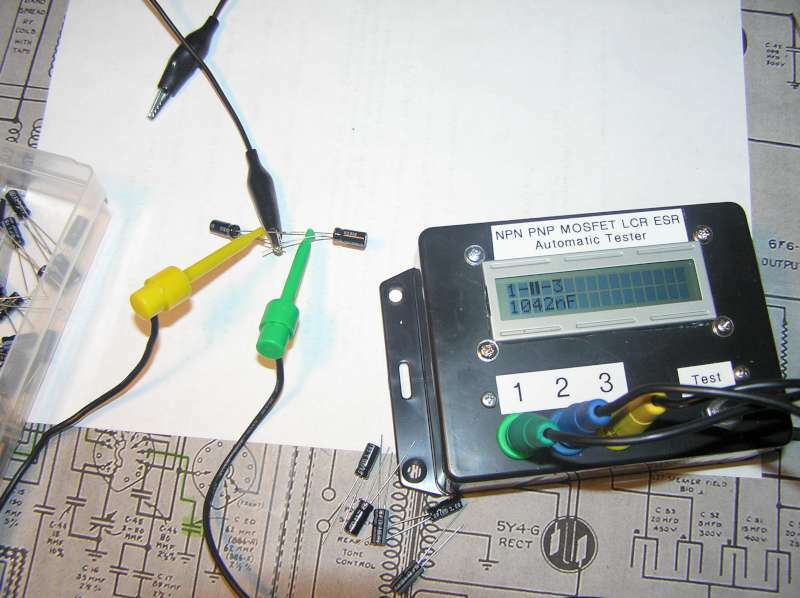 It is interesting to note the effort that has gone into adjusting the capacitance measurement accuracy. 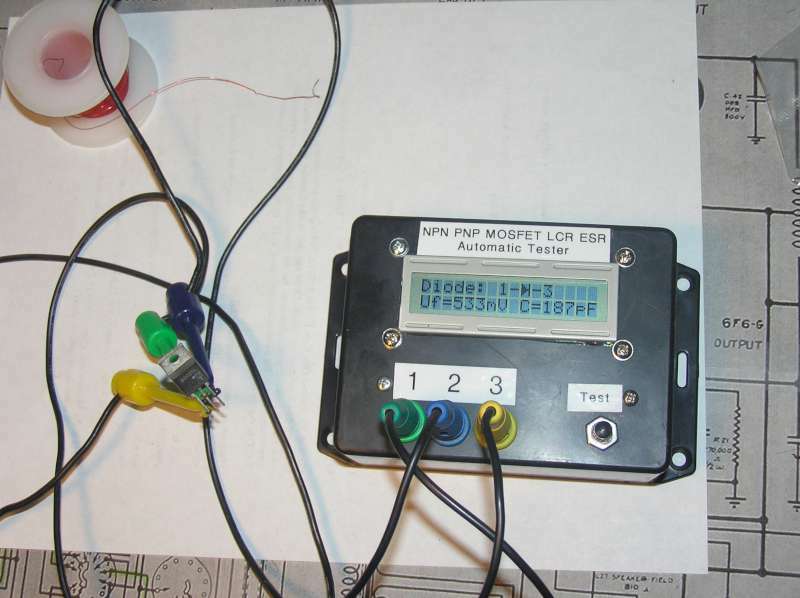 Again, I was just skimming, but he seems to have done some extensive testing of the raw capabilities compared to an LCR meter and a multimeter, (looks like the native ATmega results fell between the two) then formulated some correction factors to bring the results closer in line to the LCR results. A lot of thought and effort went into this little thing -- on his part, anyway. The Chinese just copied and mass produced. 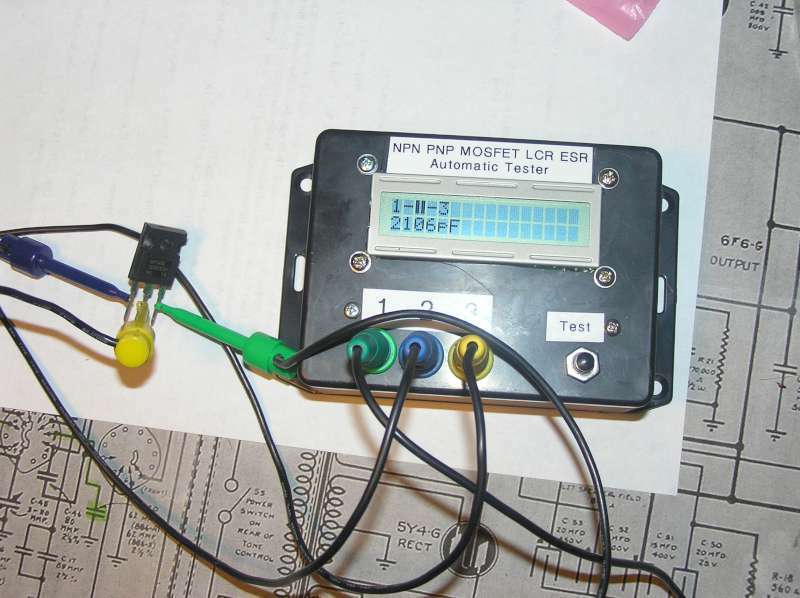 This transistor tester is a masterclass in making use of the internal hardware of an atmega. 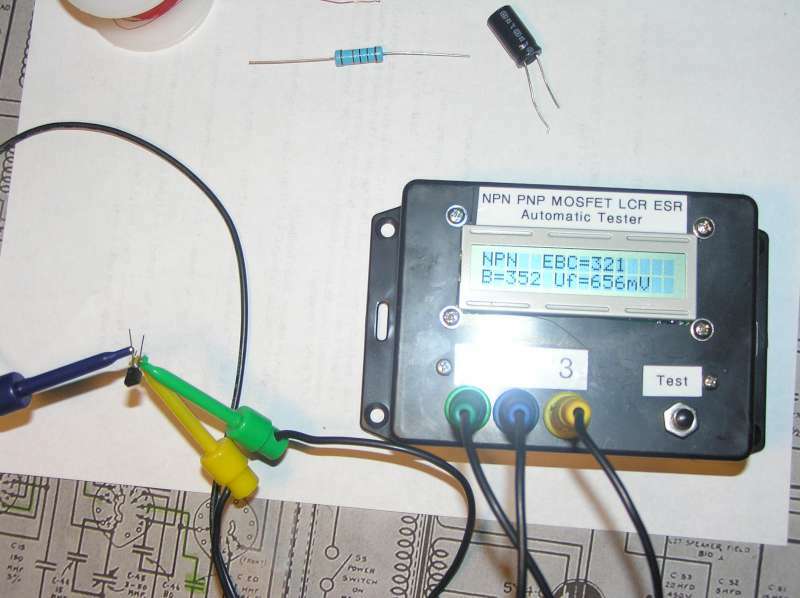 The internal analog switch resistances are measured, the internal comparitor offset is measured. The hardware is used in many different modes to achieve a result. Brilliant. It is all much more sophisticated then I was expecting. The thing you realize is that the quality of the hardware embedded in the atmega IC is very good. When you do the self calibrate, it outputs the calibration factors that also indicate something about the hardware. 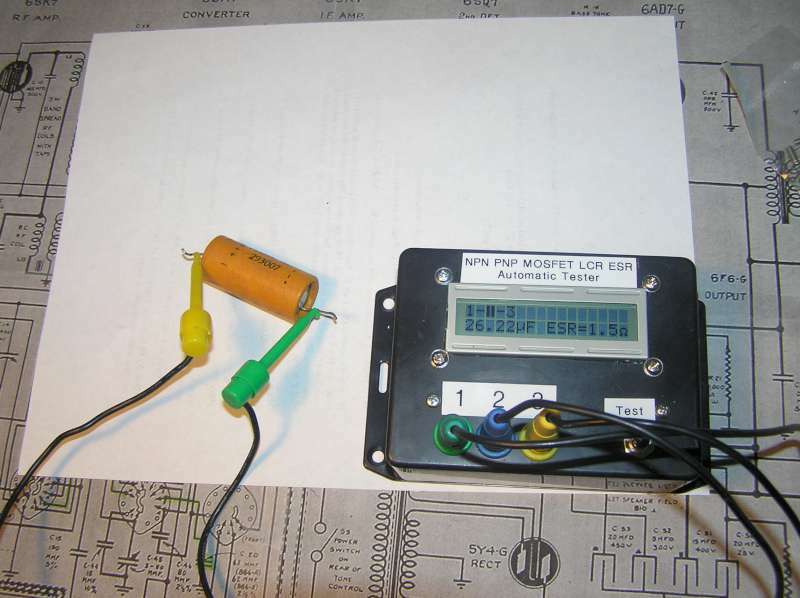 For example test 7 checks the ratios of the 470K and 680 ohm resistors to the expected. They were meant to be 0.1% resistors, so the match should be good. 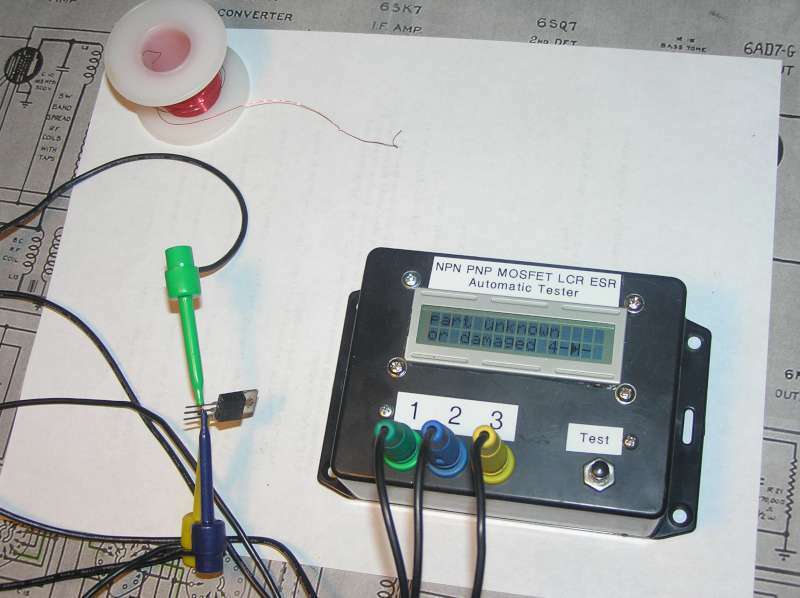 In my tester, the errors were 1 mv for each of the three resistor pairs. It does look like the Chinese did actually use 0.1% SMD resistors. I know my 680 ohm resistors match within 0.1%, but I cannot measure the 470K resistors accurately in circuit. I think they would love to build this with a chip with a better A/D, but a 5V chip is required - the lower voltage chips don't work as well for semiconductor testing. I love it when someone wrings every bit of performance out of a piece of hardware, and that is exactly what is done in this transistor tester project. They admit somethings are not optimal yet, and there are some errors they cannot yet explain, but they are continually improving the design. Well, yes, this little tester is a fine project with lots of effort put into it! Unfortunately, http://translate.google.com/ cannot handle such long threads but it is more than sufficient to translate individual posts. If I manage to find some time to spare I will rewrite this project in assembly, in order to speed things up a little bit by avoiding the C compiler bloating. 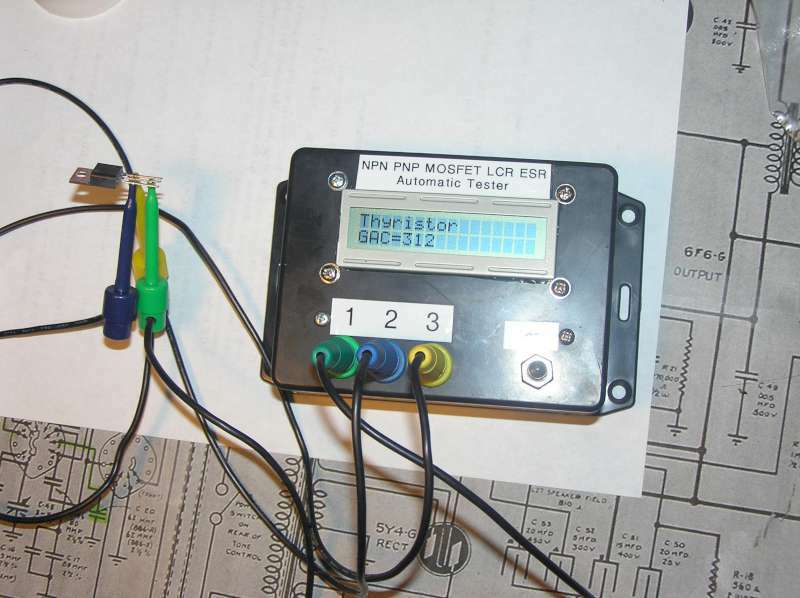 If I am not mistaken, the current version of the code (v1.06k) does not take into consideration the hardware ADC offset by initially measuring it and subtracting it from every ADC result; this would certainly improve the overall tester accuracy. Hi! This is George; and I am three and a half years old! 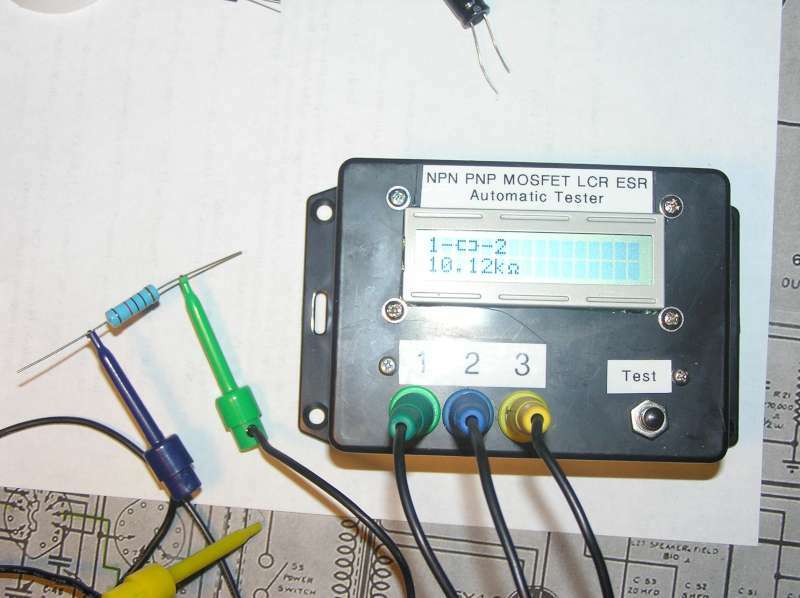 If I am not mistaken, the current version of the code (v1.06k) does not take into consideration the hardware ADC offset by initially measuring it and subtracting it from every ADC result; this would certainly improve the overall tester accuracy. You have obviously got further then me. I have only spent a couple of hours with the manual. I particularly want to work through some of the measurements like the ESR in detail. I would have though that the calibration factors that they measure and store would cancel out the ADC offsets. I cannot see any reason to correct every ADC result, when you can correct once at the end instead. I am definitely not discounting your point - I haven't looked at the calculations to see what effect errors at the start would have on the final result. It could be better to correct every reading. I just looked at the data sheet and it looks like the total error in the ADC, including offset and non-linearity is about 0.2% with a 200KHz clock rising to about 0.5% with a 1MHz clock. A complete correction of the ADC linearity and errors using our PWM voltage source would be interesting. That would need some great assembler coding for speed. 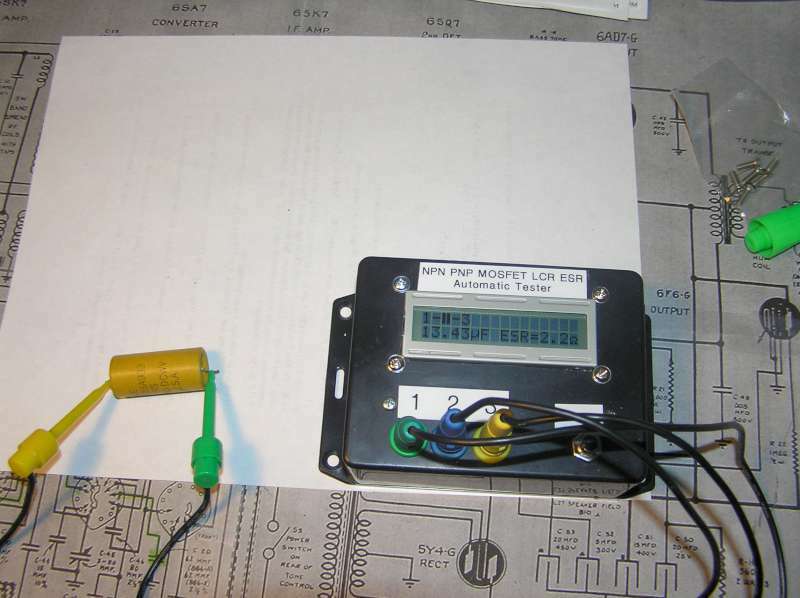 It would probably at best double the accuracy but the hardware cost would be a few caps, resistors and another test connection to output the PWM. And time. Ah no, Richard, I have not really studied the project in that depth of detail! I've just had a quick look at its source code and I noticed that omission. Now, on the self canceling out of the ADC errors, yes, theoretically it would work; but I cannot see any reason why not to subtract from the ADC results any measured possible offset, which varies from -2 .. +2 LSB according to the data sheets. Especially, when those possible errors accumulate by oversampling. Of course, summing readings that are taken both ways (positive and negative) would cancel out those unwanted accumulated quantities. My point is that it would not hurt to try this out and compare the results. Damn, both of you Richard and George have made me to put this thread in one of my top watch list. Yeah, it is starting to look like this thread is taking on a life of it's own, doesn't it? I don't seem to have any caps above 1000uf available, so I started stringing them together. The ESR value is definitely self-calibrating depending upon the highest capacitance it has measured. Adding each successive capacitor, the ESR is shown as 0? on the first test or two, then settles around .01 to .03 ohms. Testing a control cap, the indicated ESR climbs slightly each time the baseline is set. I got up to ~7200uF and the control went from 0.01ohms to 0.12ohms. Actually, there is about .02 ohms variability there -- pushing the test button repeatedly without disturbing the leads at all will result in successive readings between 0.11 and 0.13 ohms. So don't take the ESR figure as gospel. It's really a comparison with the ESR of the largest cap it has previously encountered (since the last self-test/calibration) considered as 0. Actually, speed is no concern since a lot of the time the firmware has to wait, e.g. for the ADC. There's also no gain from changing the crystal from 8 to 16 MHz; a faster ADC would help. A zero offset of the ADC was already discussed and the idea was dropped. A changing offset (=noise) helps with the oversampling. +1 I am with BravoV, nice job with documenting guys And thanks for the measurements Torch. I ordered one a week ago, might build a case for it too. I'm involved with mentoring the local high school's robotic's club (don't worry, not the electronics, I help out with machining the mechanical bits! ). Anyway, they are looking for some fundraising ideas. They have a PVC 3d printer in the shop class. Would there be any interest in having cases made for these? Maybe a kit with the leads, shielded bannana plugs and clips included? And a separate battery compartment. I would definitely want a separate battery compartment. What other features would you look for and how much would something like that be worth to you? This two kind gentlemen are well known to generate a really excellent discussion when they're "in-sync" with each other at the same topic similar at this one here. 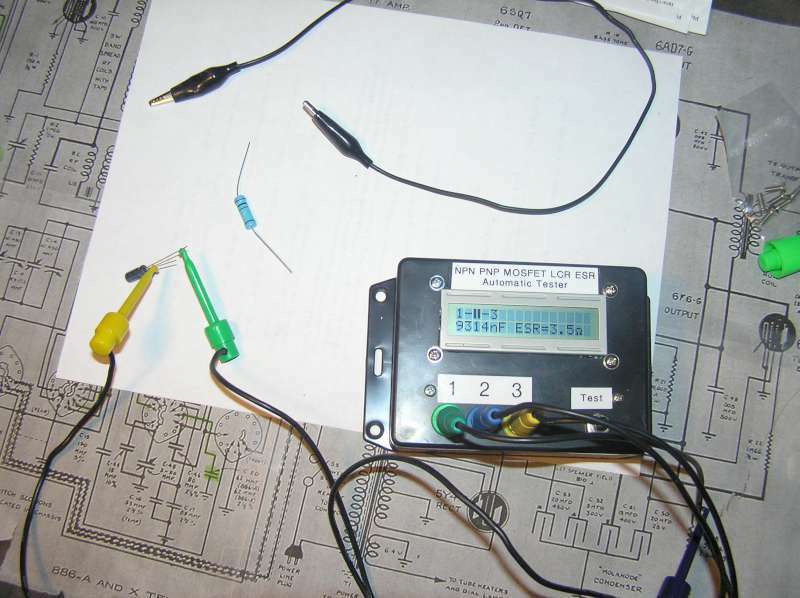 Here an example at the topic on generating an adjustable + high resolution voltage reference using cheapo components -> Amspire's thread : General Purpose Power Supply Design. Imo it is one of the best among finest threads in this forum, just take a cup of coffee and read it your self, its a long thread. Too bad that project is on hold. Ok, enough OOT, I bet you've got my point.